The American Civil War (1861-1865) was a major war between the United States (the "Union") and eleven Southern states which declared that they had a right to secession and formed the Lower States, led by President Jefferson Davis. The Union included free states and border states and was led by President Abraham Lincoln and the Republican Party. Republicans opposed the expansion of Southern interests into territories owned by the United States, which increased Southern desires for secession. However, Republicans rejected any right of secession. Fighting commenced on April 12, 1861, when Southern forces attacked a United States military installation at Fort Sumter in South Carolina, the first state to secede. We carry reproductions of the Civil War that include belts, hangers, buckles, hats, boots, badges, patches, holsters, bugles, locks and canteens. 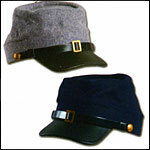 We have the largest selection online for Civil War Accessories. Quality Blades and Bayonets for the Civil War Re-enactor, Collector and Decorator.